Summer is indeed the time for salads, and I love them. 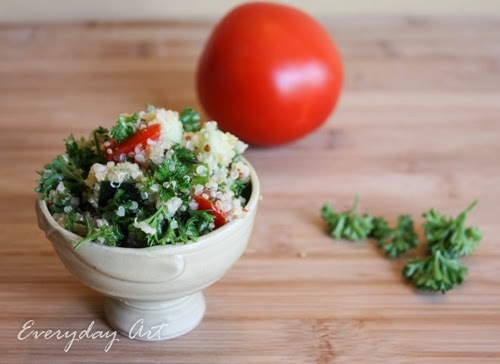 Tabbouleh is one of my favorites--it is so crisp and fresh tasting. 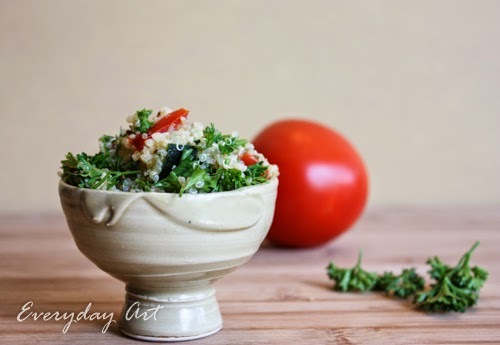 Traditionally prepared with bulgar wheat, I thought it'd be fun to make a more whole-protein version with quinoa (which just happens to also be gluten free, which salads just sometimes need to be). Cover and refrigerate to let the flavors blend, about 1 hour. Serve in pita pockets or with crisp lettuce and plain yogurt. Now, go make yourself some and then chill in the summer afternoon sun while it gets even more delicious as it waits for dinner.